Fancy seeing the sky in neutrino? Supermassive black holes and enormous stellar explosions may give up their secrets now thatneutrinos from space can be detected. 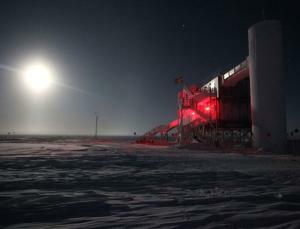 The South Pole IceCube neutrino observatory has seen a handful of ghostly high-energy neutrinos that almost certainly came from outer space, opening up the skies for neutrino astronomy. “We are witnessing the birth of this field,” says Dan Hooper, a theoretical astrophysicist at Fermilab in Batavia, Illinois, who is not a member of IceCube. Until now, the only space neutrinos definitively detected came from the sun and a 1987 supernova explosion in the Large Magellanic Cloud. Last month, the IceCube collaboration published news of the detection of two high-energy neutrinos, each with an energy of about one petaelectronvolt. These neutrinos, discovered by accident a year ago and nicknamed Bert and Ernie, prompted the collaboration to go back and look at their data in more detail. The new analysis, reported today at the IceCube Particle Astrophysics symposium at the University of Wisconsin-Madison, has raised the stakes…. This entry was posted in ASTROPHYSICS, High Energy Physics and tagged IceCube, neutrinos. Bookmark the permalink.